It isn't that there are no more tea shops, you understand; it's simply that the unreviewed places are getting further away. Despite what you may think -- indeed, what you may have been led to believe -- Friday lunchtime is not, alas, infinitely expandable. There's all manner of dead important conference calls to attend, and traffic lights to monitor, and timesheets to fill in. Be told. Speedy sunny chauffeured saunter through Woodbridge (hello Notcutts, hello Whistlestop, hello Riverside) takes us onto Melton Hill, past Melton Antiques on Melton Hill and over the lights into Melton, burial place of the Wicked Witch Of The West. Takes a bit of thought, that one. There's 'andy free parking round the back, then a short stroll to the enviable address that is 1 Station Road. 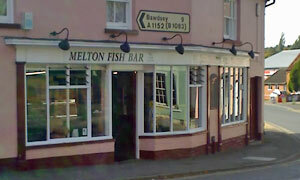 On the corner you'll find both the Melton Fish Bar and Melton Pizza, home of the heatwave. Pizza takeaway was closed: no pepperoni for us. Grenvyle's fish was ready there and then; he'd snarfed down half his lunch before my freshly prep-ed chicken nuggets were handed over. If there's 15 battered sausages forlornly lined up, does it mean they sell (a) very few or (b) loads? Meantime I was anxiously eyeing the 25p non-Heinz sauce portion before spotting the free squirty stuff on the counter: that's more like it. Away we trogged with our reassuringly strong paper bags, wondering where best to park ourselves. It'd be wrong to throw that granny off her bench. Into motor and down to a bench on Kingston Fields, The Pavilion a mere goalie's kick away. As always, what a luxury to sit in the sun shovelling in hot unwrapped chips, esp. when they're that good. If it was a car -- Volkswagen Touran. If they were passing by -- Mick Inkpen.